Do you grind your teeth? If you're not sure, ask your family—sometimes the sound of teeth grinding against teeth might make enough noise to be keeping them up at night. You might also be waking with sore jaw muscles and joints. If you suspect you have this habit of involuntarily grinding, gnashing or clenching your teeth, it's a good idea to get it checked. Here are 3 things you should know about this odd habit. Teeth-grinding more prevalent among children. Children are more likely than adults to grind their teeth in their sleep, thought to be a consequence of their developing swallowing mechanism, but usually grow out of it without any long-term effects. Adults with the habit seem to grind their teeth for different reasons, one of the most significant being a response to high stress. Tobacco could be another factor: users are twice as likely as non-users to grind their teeth. Adult teeth-grinding may also be associated with high caffeine consumption, illicit drug use or Parkinson's Disease, which impairs brain nerve function. Sleep apnea can be an underlying cause. There's one other major underlying cause to add to that list: obstructive sleep apnea. One international study of thousands of patients from different countries found both high anxiety or stress and sleep-related breathing disorders were two of the most significant risk factors for adult teeth-grinding. It's believed the physical stress generated by these temporary episodes of breathing obstruction occurring several times a night could trigger teeth-grinding. Teeth-grinding can cause dental problems. While having a teeth-grinding habit doesn't automatically mean you'll have dental issues, your risk can increase dramatically. Due to its chronic nature, teeth-grinding can lead to excessive tooth wear, dental work damage or jaw joint dysfunction. In some extreme cases, it could cause tooth fracture. If you grind your teeth, your dentist may be able to help by creating a custom-made occlusal guard that can reduce biting forces while you're wearing it. You might also minimize teeth-grinding by quitting tobacco and other lifestyle changes, or getting a better handle on stress management. And if you're also diagnosed with obstructive sleep apnea, getting treatment for that condition will not only improve your overall health, it could help put an end to your teeth-grinding habit. Your teeth naturally wear as you age, but you may be making it worse if you grind your teeth. 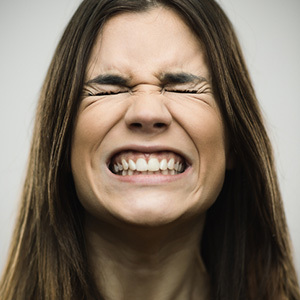 Teeth grinding is a behavior that causes the teeth to gnash, grind or clench against each other generating forces greater than those produced from normal biting. These forces often result in tooth wear that cause not only functional problems but result in a more aged appearance. Grinding occurs while a person is awake, but most often episodes occur while asleep at night. Teeth grinding is quite common in children, but not usually of great concern since most grow out of it. There's even a school of thought that teeth grinding might even help readjust an uneven bite. Among adults, though, other factors seem to contribute to teeth grinding. Many researchers believe nighttime grinding occurs as a person passes through different sleep phases including deep REM (Rapid Eye Movement) sleep. It may also have a connection with chronic snoring. Certain medications seem to contribute to teeth grinding, particularly psychoactive drugs like amphetamines. Nicotine falls in this category, which could be why tobacco users report twice the incidence of the habit compared to non-users. Teeth grinding is also connected to another fact of modern life: stress. 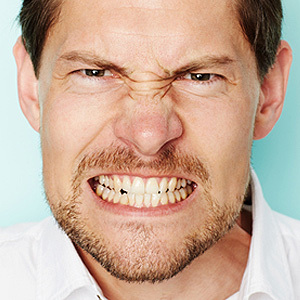 People who grind their teeth tend to have higher levels of anxiety, hostility or depression. Because there are multiple triggers, there are many treatment approaches. Whatever course we take, our aim is to eliminate or minimize those factors that contribute to your habit. For example, we can create a custom mouth guard for night wear to prevent the teeth from making solid contact and thus reduce the biting pressure. Perhaps the most important thing is to control or reduce stress. This is particularly helpful at night to prepare you for restful sleep by changing some of your behaviors. We also encourage investigating other stress therapies like biofeedback, meditation or group therapy. Whatever the means, bringing teeth grinding under control not only reduces problems now, but could also help prevent abnormal teeth wearing and future health issues down the road.